Representatives from West Chiltington Parish Council joined with Rural Housing Trust Limited last Thursday to launch the sale of six new homes for shared ownership. People with a strong connection to the village will have first priority to buy the four two-bedroom and two three-bedroom houses that are being sold through local estate agents Arun Estates. Completion is expected in June. 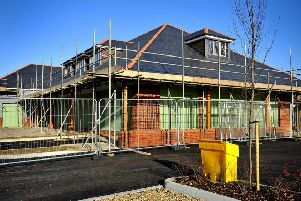 These houses are part of a development of 14 new affordable homes being built on land off Steele Close within walking distance of the primary school and village centre. Chairman of the Parish Council, Councillor Marshall Monks, toured the site with RHT chairman Christopher Hobden, and was delighted to see the good size of the rooms inside a partially completed three bedroom home.